Last Saturday night my wife and I had a date night. This is the term my wife uses for when we get our occasional night away from the boys and have dinner out. I must admit that I do enjoy date nights and my wife’s company so the name is very fitting. As we live in the inner west of Sydney we decided that we would head over to Concord and pop into one of the many Italian or bistro style joints along the strip, if we could score a table without a reservation. We were lucky to get the only available table at Antoine’s Grill, a French bistro we’d walked past before and said we must try one day. We were in for a treat! My wife really wanted a glass of sparkling so we ordered a glass each of the Fork & Spoon Sparkling Brut NV from South Australia, the only sparkling by the glass (there’s a few Champagnes by the bottle though). It was a fairly average sparkling. Not offensive, but no depth of flavour or length. Out came the entrées and they were an absolutely delicious way to start off what turned out to be a night that went from one taste sensation to another. 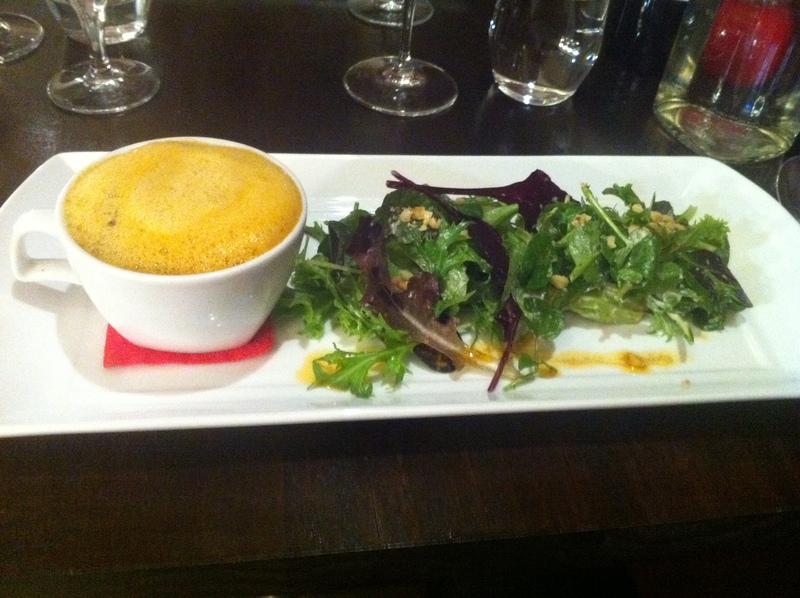 We both got the Spanner crab soufflé and it was just so savoury and divine. We both loved it, and the Fork & Spoon Sparkling Brut actually went quite well with it. For our mains my wife ordered the grilled salmon and I ordered lamb shanks. I really wanted a red to go with the lamb, but we didn’t want anything too heavy that would take away from my wife’s salmon. 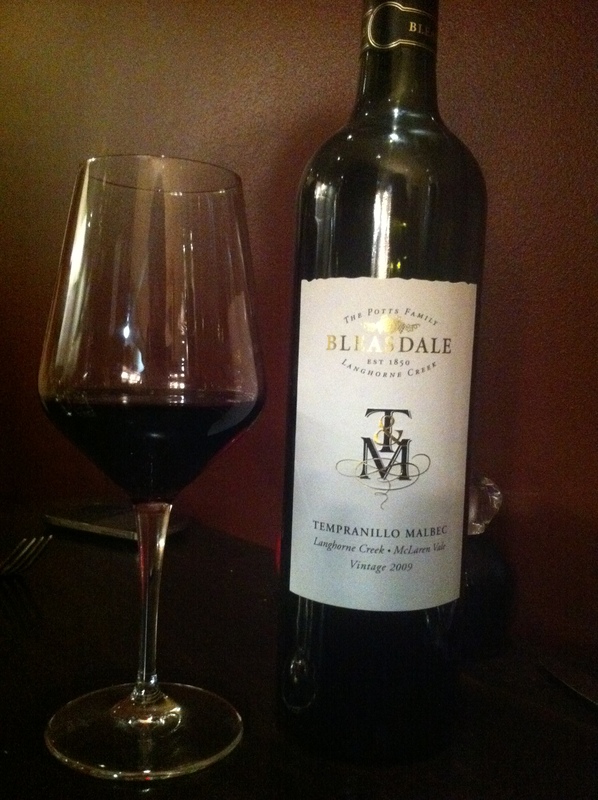 So we ordered a bottle of Bleasdale T&M Tempranillo Malbec 2009 from Langhorne Creek, which is described as a medium bodied red. Another reason why I picked this wine is because it is such an unusual blend, Tempranillo and Malbec usually don’t go together, but this wine is typical of the freedom Australian wine makers have to blend however they like. Tempranillo is primarily used in making the Spanish wine Rioja. Malbec is one of the six red grapes used in making Bordeaux and is usually only added in small amounts, if at all. The Argentinians and Chileans have taken to making some intense single varietal Malbecs, but it’s not widely made in Australia, although Bleasdale are known for their Malbecs. This turned out to be an absolutely sensational wine for the occasion. 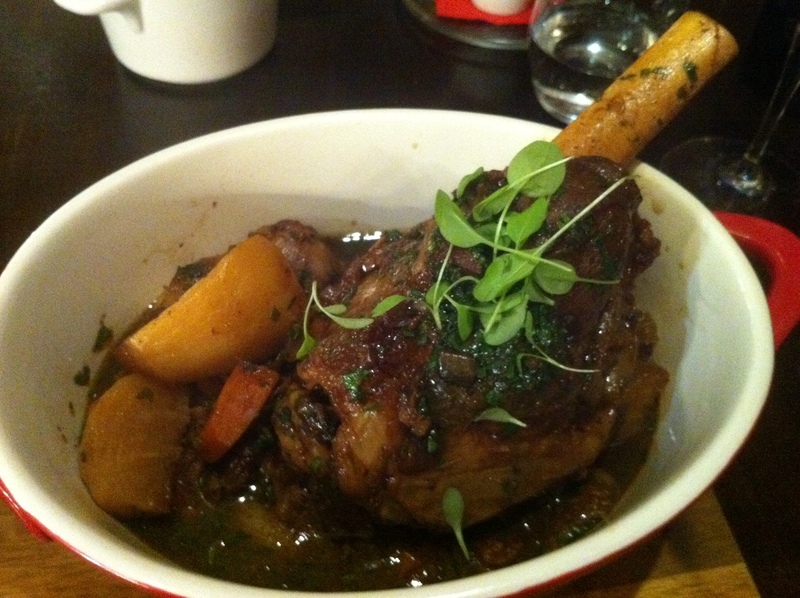 What it lacked in body it made up for with an array of flavour and it had decent length. I could still taste it after speaking several words, about how nice it was of course. My wife described it as being very smooth and tasty. 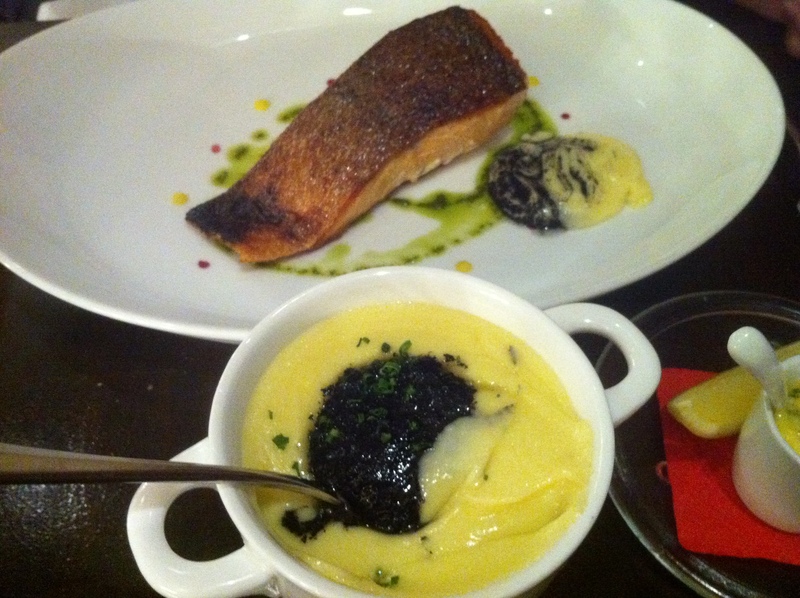 Our mains didn’t let us down, and the side of truffled mash was a hit. The olive tapenade helped counter the strength of the truffle oil and the mash was just so creamy. I asked Thomas, the restaurant manager, for a suggestion on the dessert wines. He said he had a red and a white French Banyuls from Domaine Du Mas Blanc. He was kind enough to let my wife and I both sample a small glass of each. 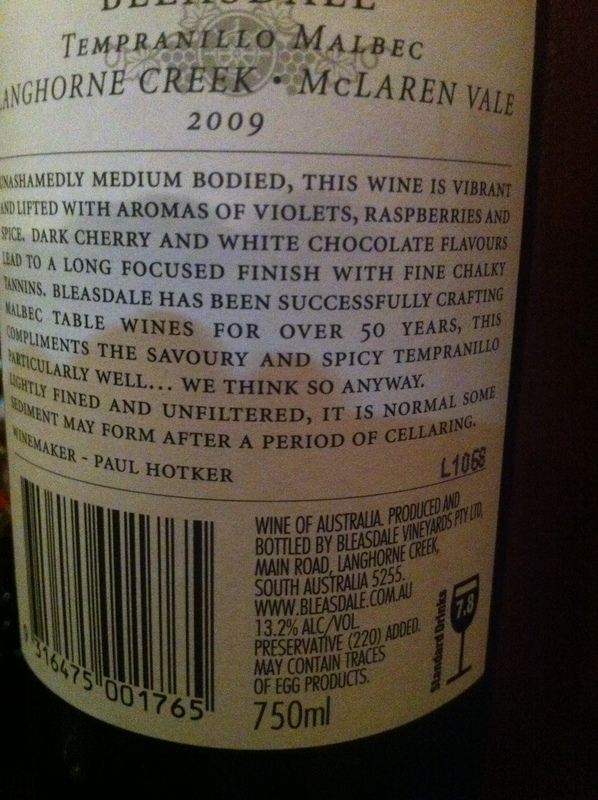 The white was like a dessert wine and almost tasted like an alcoholic verjuice. The red on the other hand was like nothing I had experienced before. It was quite cloudy and tasted port-like but it was so smooth and rich with a decent finish. We both went with the red banyuls and thoroughly enjoyed our glass. caramel, chocolate, lemon marshmallows, orange, bourbon vanilla & quince. At first I thought the Crème brûlée 6 ways sounded too busy but when I saw it go by to another table, with it’s egg tray and egg shell on the side sitting on fairy floss, I just had to get it. 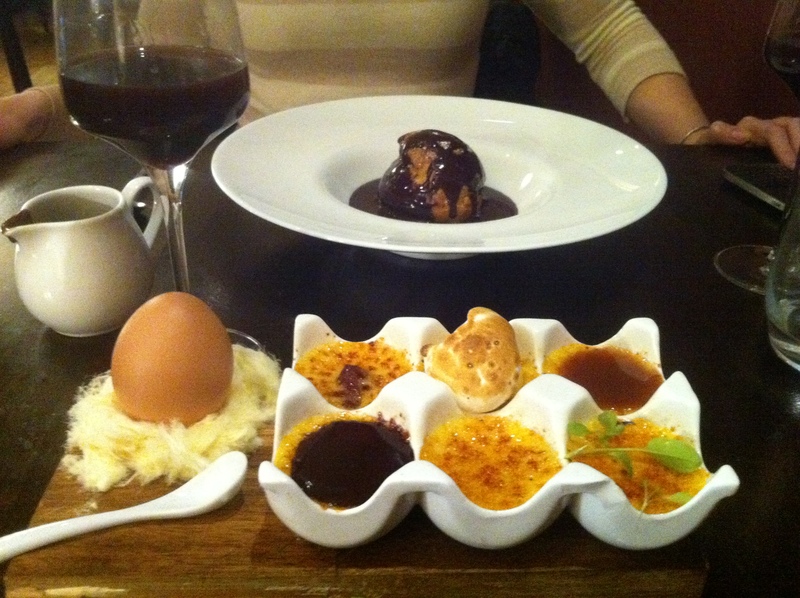 The Crème brûlée 6 ways was like nothing either of us had seen or tasted before, a special dessert indeed. I enjoyed sipping my banyuls in between each different brûlée. A totally new and enthralling experience. My wife enjoyed her crusted profiterole too by the way. In the end, we had a cracker of a date night with great food, wine and service, not to mention each others company, and that’s what it’s all about. Interestingly the profiterole was one of their favoured desserts until the 6 ways was created only a couple of months ago. Talk about being out-shined! I want that creme brûlée 6 ways….nothing beats a good creme brûlée! I think you’ll find that the trip out there, so you can try this, would be well worth it! I’ll be back just so I can tee it up again with the red banyuls. Yum! Darn you Conrad, now I’m hungry again and ate dinner an hour ago. Guess I will just have to have a very early midnight snack. LOL! Do you really need an excuse for a midnight snack? I like to rationalize things. But I have to plan now because I will be having breakfast at midnight. ;) I might just start living on Australian time. Which means it’s about lunchtime. And that works also. It will be midday in about 25 minutes … can you hold off? Nice! Never seen it stateside. Time for a hunt.